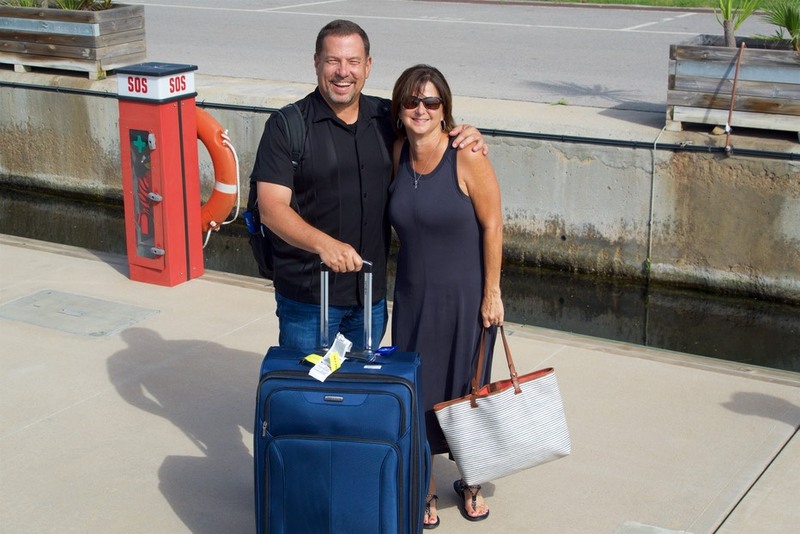 Well with the arrival of Barry and Kim from Louisiana and Jim and Cathy from Texas still onboard we were officially outnumbered onboard Katherine by Americans. 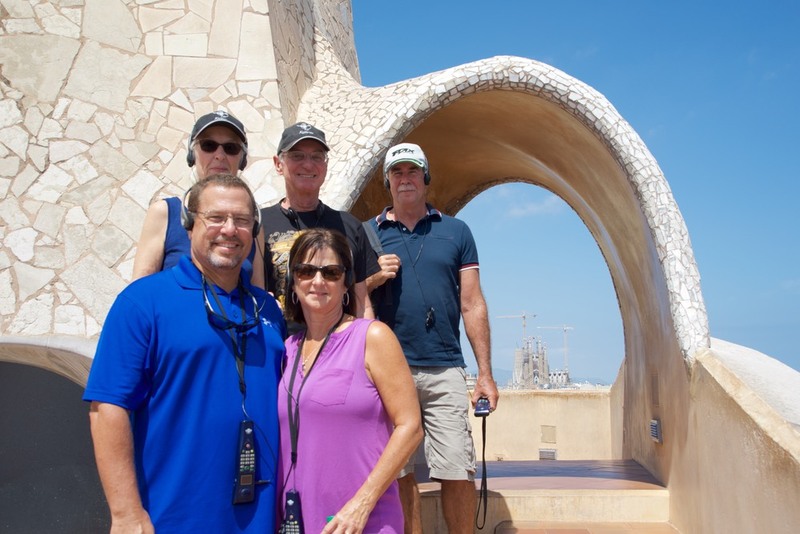 We had planned the overlap of visitors so that the six of us could have the opportunity to spend a few days in northern Spain travelling together before Jim and Cathy headed home. 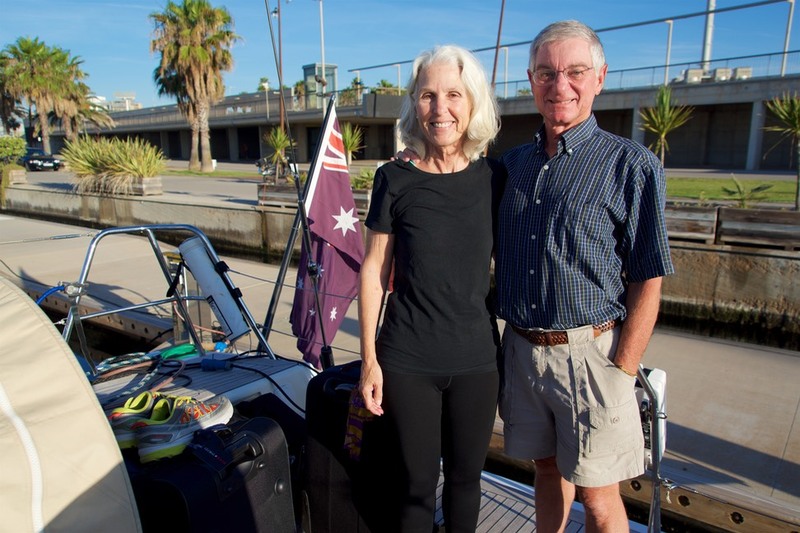 Katherine had found a space at Port Forum, a marina located just six kilometres north of Barcelona. The old town was easily accessed by a tram that stopped just a short walk away from the boat. 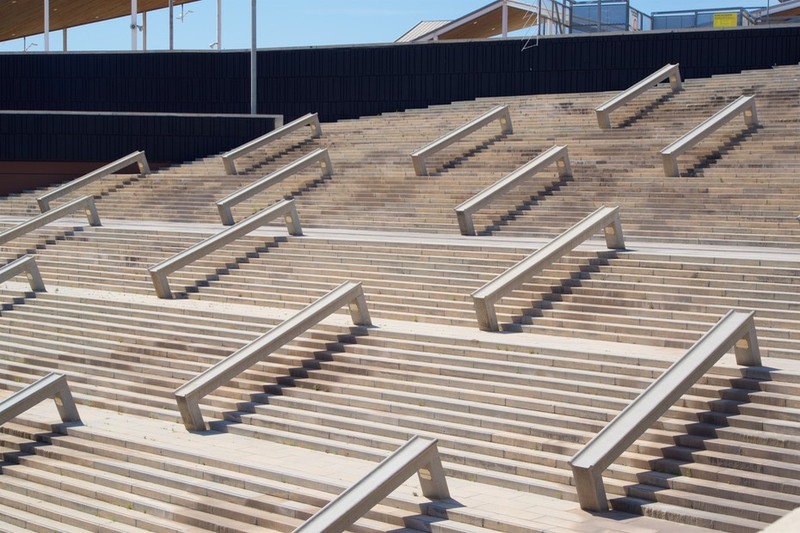 As we discovered on the day of our arrival it was also the home to Parc de Forum, a huge sprawling area of unique architectural outdoor spaces that host concerts, festivals and trade shows. A Music Festival was in progress on our arrival and the music beat that reverberated off the boat until 530am in the morning brought back memories of our first season of sailing and experiencing summer in Russia. 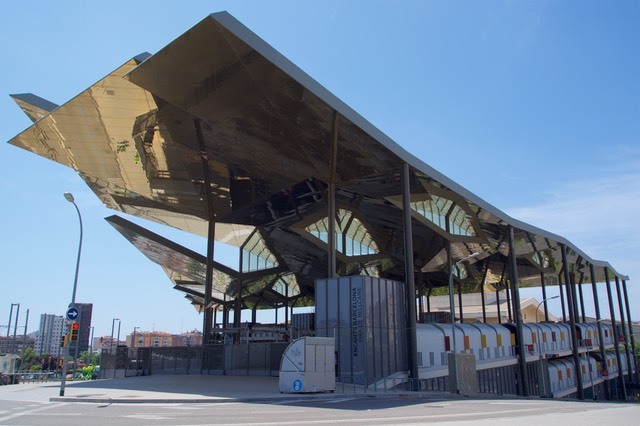 Before heading off on a road trip we planned for one day in Barcelona. Having not been here for around 10 years we were keen to join everyone on the Hop On Hop off Bus and take in the sights. Definitely the best way to get an overview when short on time. 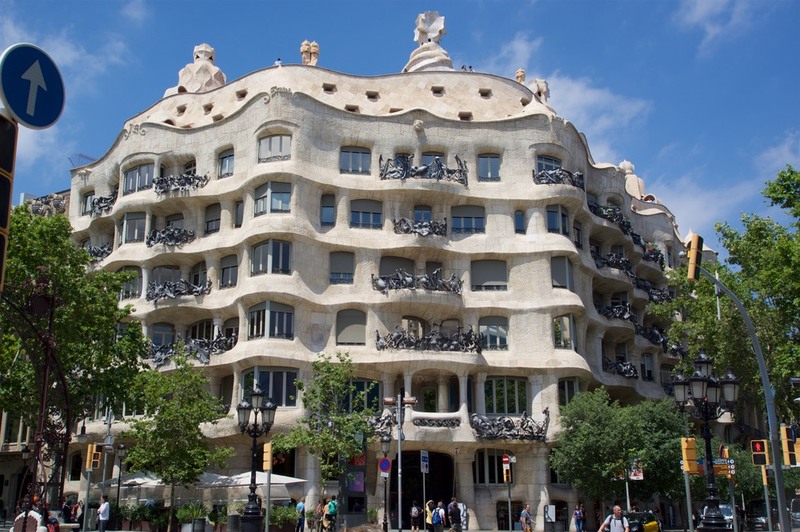 There is certainly a lot to see and experience in Barcelona but one has to visit at least one of the “Catalan Modernisme” styled buildings that are to be found in the Quadrat d’O. This is an area within the city where the wealthy bourgeoisie of the mid to late 1800’s embraced the artistic style for both residential and commercial buildings. (Eyewitness Travel). 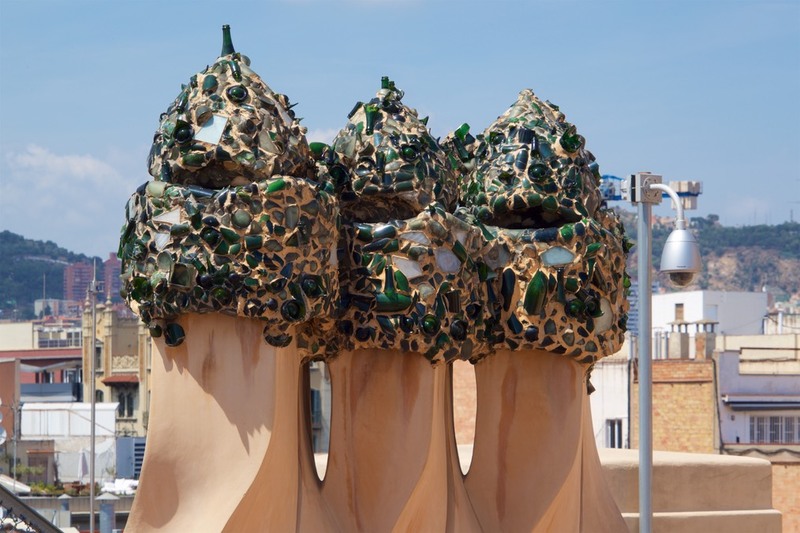 One of the most infamous architects of this city is Antoni Gaudi whose work is found in buildings and parks throughout the city. We visited Casa Mila “La Pedrera” which was Gaudis last commercial building project before he would devote his life to the construction of the Sagrada Familia. The eight storey high apartment block is topped by air ducts and chimneys that are more Star Wars like then the normal chimney stack. 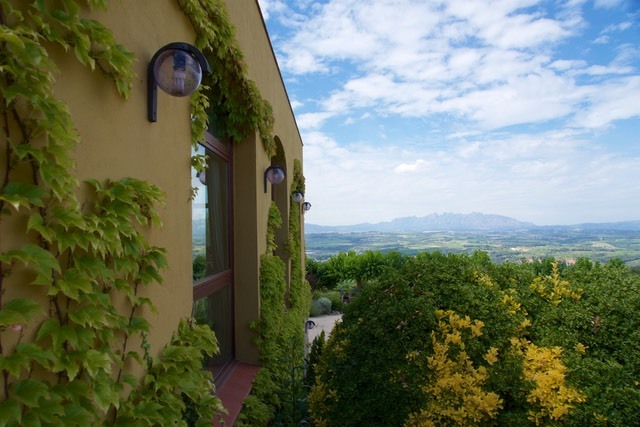 Throughout the property his attention to detail is evident and his uniqueness with no straight walls leads one to question if he was a genius or just bordering on architectural madness. From the rooftop of Casa Mila “La Pedrera” a view of the Sagrada Familia is afforded, the place where Gaudi literally spent the last days of his life, and which we planned to return to after our road trip. 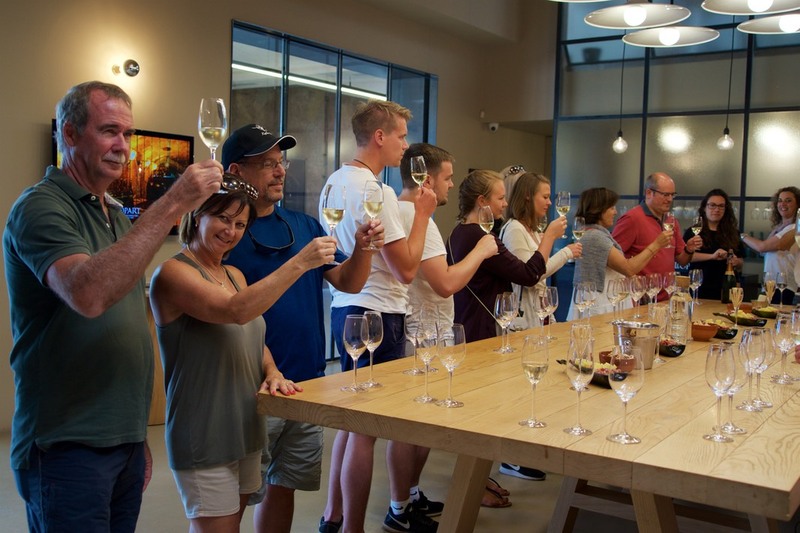 So what to do for an itinerary with American friends who have never visited this region of Spain - tour a winery, explore historical buildings, sample local Spanish food and take in some awesome scenery. Oh and be prepared to change the plan! First stop was the winery of Llopart. 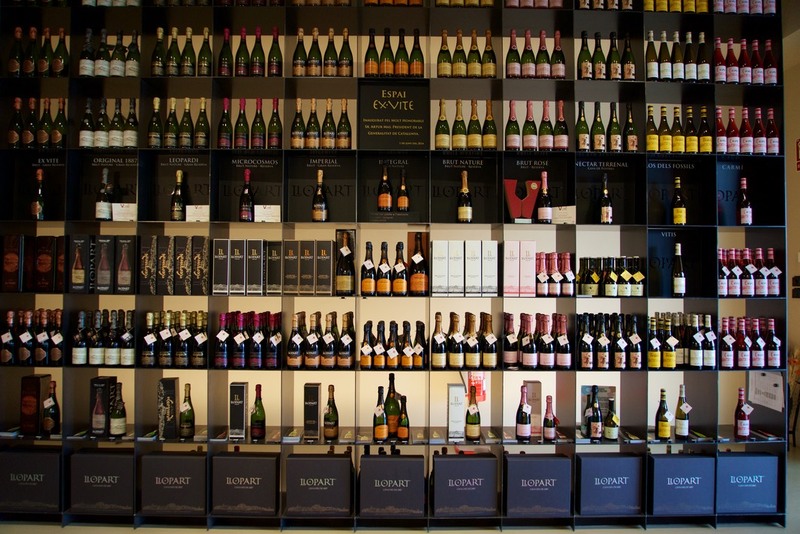 As luck would have it we arrived in time for a wine tour of this family run operation that has been producing cava since 1887. The passion of the presenter was only topped by meeting Pere Llopart i Vilaros now in his 80’s. 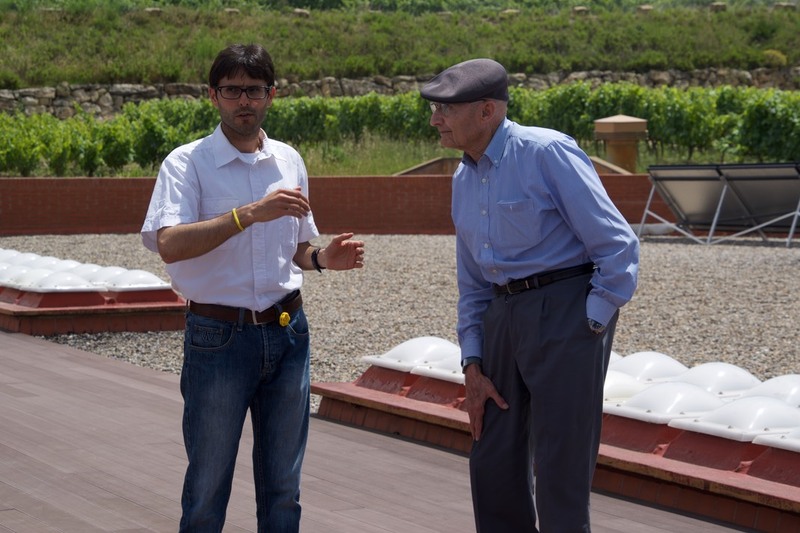 Pere had taken over from his father in the early 1950’s and is said to be responsible for the development of “craft" cavas and having set the high standards of Cava organically produced at Liopart. Still a business man he welcomed each of us individually and handed out business cards to make sure we knew how to buy his wines once we left the premises. The wine tasting was accompanied by some delicious local produce. Possibly one of the best wine tastings we have done in a long time, not just for the wine but because of the passion of the people at the winery. Of course our hire car suddenly became laden with several cases of cava. 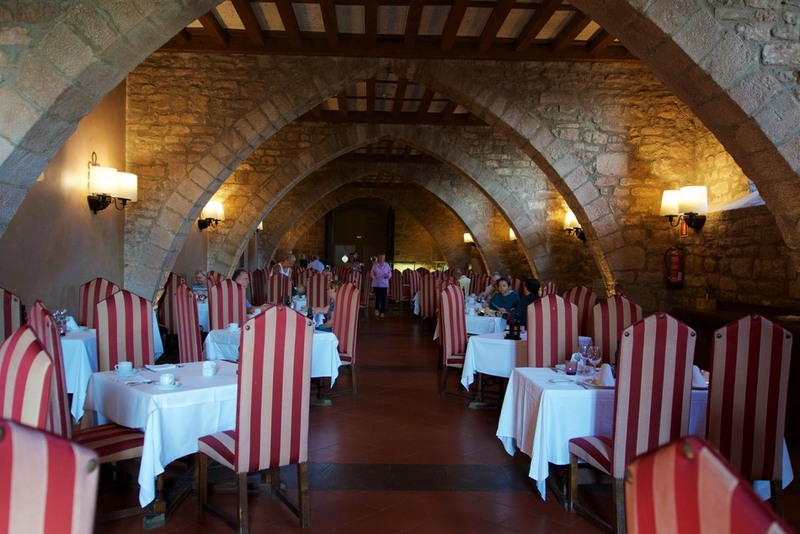 Thanks to the recommendation of one of the local ladies attending the wine tour we travelled just a short distance up the road to the restaurant Mirador which afforded views of Montserrat and served up the most delicious Catalan feast. 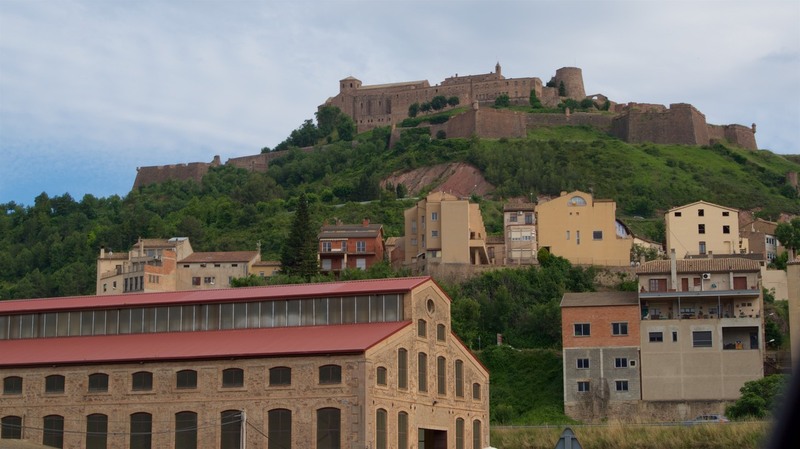 Our accomodation for our first night on the road was at the Parador Cardona. 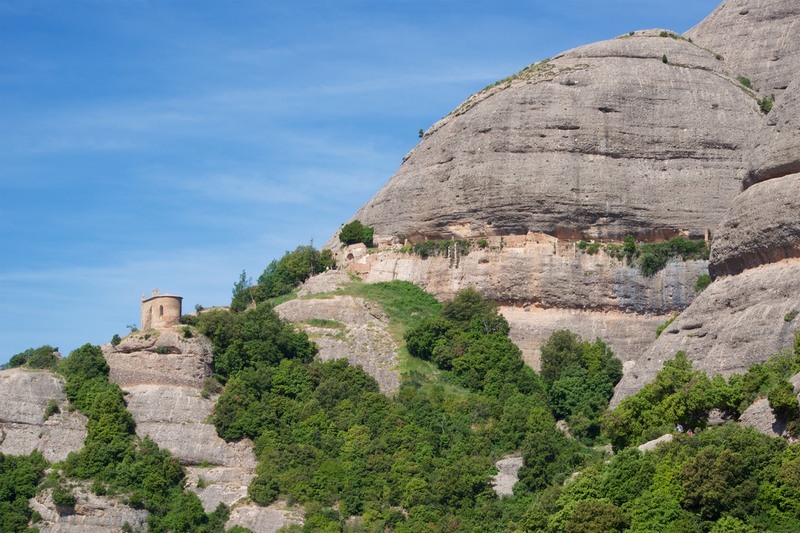 A 13th Century Castle that was home to the Dukes of Cardona. Rebuilt in the 18th century it is now a Parador - a building of architectural or historical importance that is owned by the government and used for accomodation. The Castle overlooks the Montanya de Sal (Salt Mountain) that has been mined since Roman times and brought wealth to the area. At breakfast the next morning sitting in the restaurant with its high backed seats and arched ceiling one would not have been surprised to suddenly see people in tudor costumes or knights in armour parading by. It had been a very special place to spend a night surrounded by so much history. Before leaving the castle to walk the streets of Cardona we visited the 11th century church that stands beside the castle. 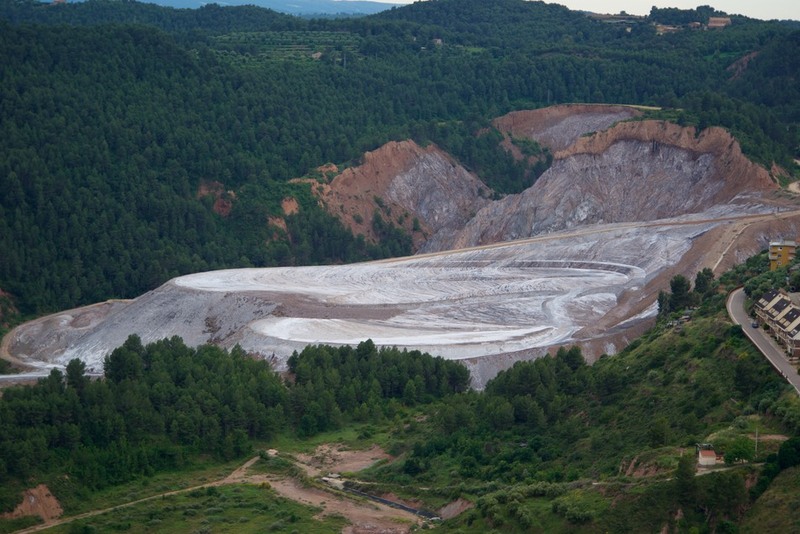 Esglesia de Sant Vicenc is the resting place of the Dukes of Cardona. As always the size of these churches and the engineering feat to build them always has to be admired. 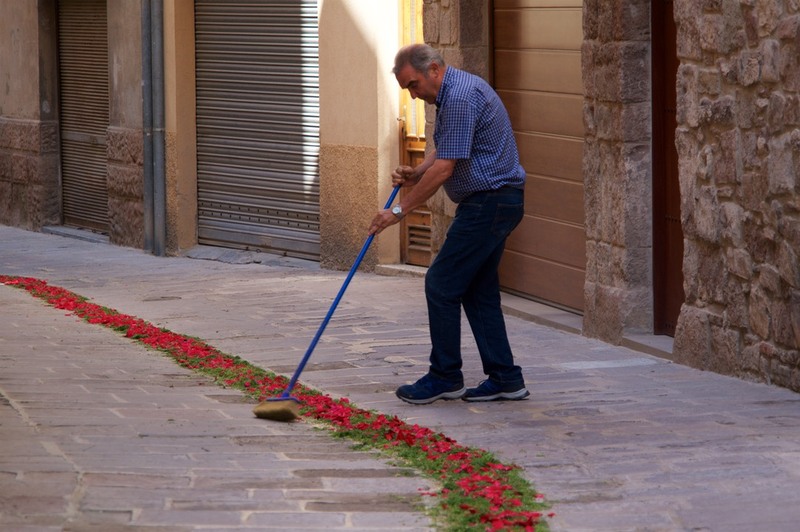 In Cardona we came upon a man carefully sweeping flowers into a line down a long street. Unfortunately due to our lack of Spanish all we could ascertain was that it was in preparation for a fiesta. When Andrew and I walked the street all of the flowers were beautifully presented. Apparently not long after the joy of kids being kids, was witnessed by Barry and Kim, as the flowers were sent into disarray as they blissfully unaware played soccer down the street. Guessing the guy with the broom would not just be sweeping flowers into order again but chasing some kids with his broom as well! On route to our next stop of Montserrat we drove through some beautiful countryside and passed through some seriously sleepy towns. In the city of Manresa we came upon the 19th Century Jesuit Church which houses the Holy Cave of Saint Ignatius. 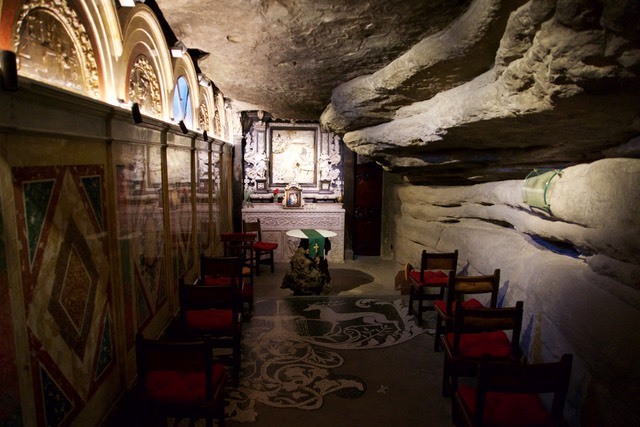 The amount of sculptures and mosaics depicting stories of Saint Ignatius life and the small cave where he is said to have written the Spiritual Exercises book was truely impressive. Just another unexpected stop of discovery. 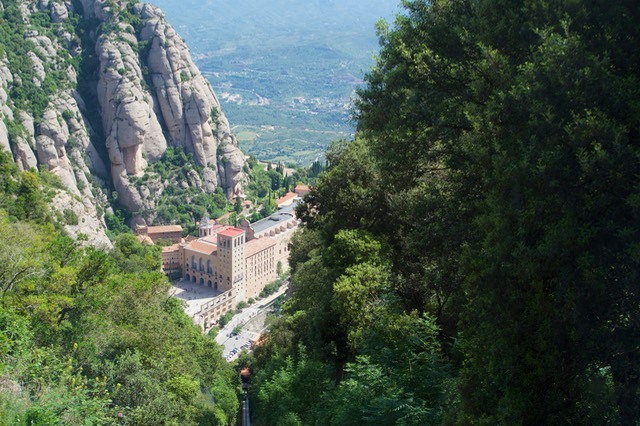 Our second nights stay was at Hostel Abat Cisneros located beside the Monastery de Montserrat built on the mountain of Montserrat or "Serrated Mountain" that peaks at 1236 meters. We were fortunate that we drove up in the late afternoon and there was less traffic on the hill, the following day as we departed we were amazed to find cars on their way up bumper to bumper most of the way down the mountainside. The Monastery was founded in the 11th century but was destroyed in 1811 in the War of Independence by the French. 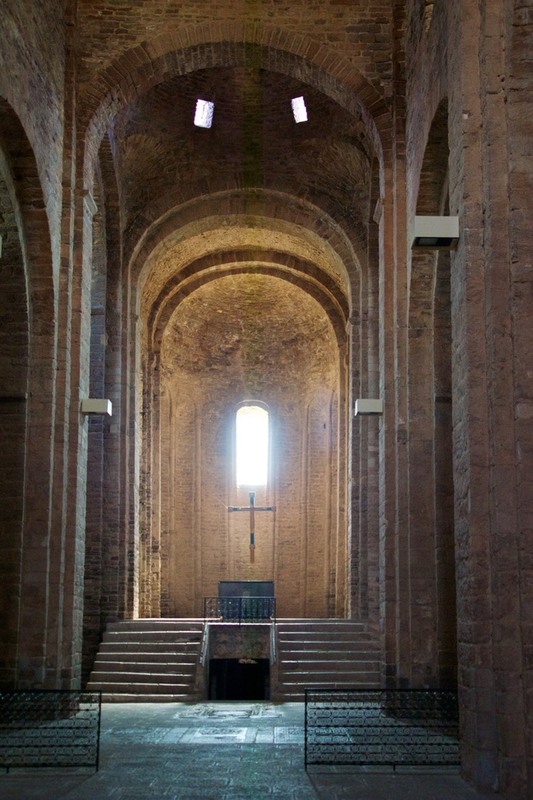 It was subsequently rebuilt in 1844 and is today home to the Benedictine Monks. 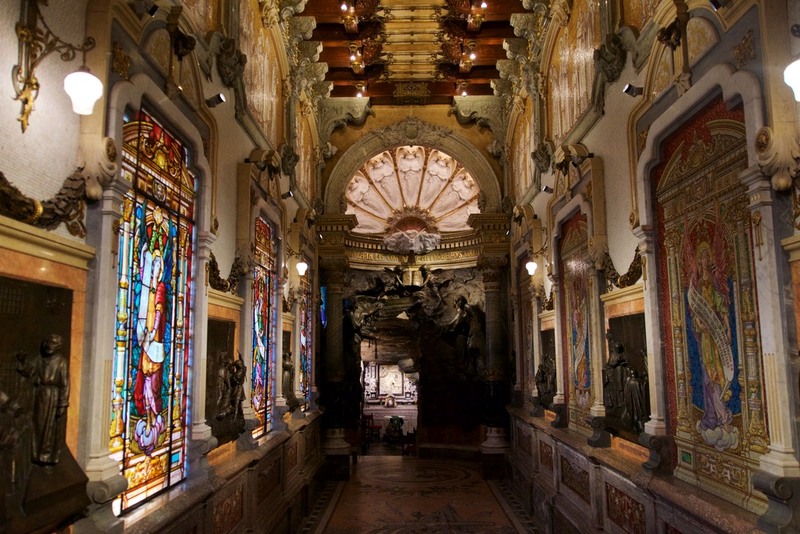 Within the Basilica is housed the wooden statue La Moreneta or Black Virgin of Montserrat. It is believed the statue was carved around the 12th century. Today thousands of pilgrims line up to view the Black Virgin and to touch her wooden orb that protrudes from her protective glass. To say we were a taken aback by the crowds would be an understatement. Though we enjoyed walking the grounds of the monastery, hearing the choir sing in the evening, the highlight was definitely taking the funicular the next morning up to the walking tracks above the Monastery. This would certainly be an area to return to take on the walks amongst the higher peaks where chapels and ruins of hermit dwellings are scattered amongst the mountainside peaks. As we had sailed in with Jim and Cathy the Sagrada Familia with its imposing spires could be seen from the sea so it seemed appropriate that we endeavour to visit this most unique church that has become a shrine to work of Antoni Gaudi on their last day in Spain. 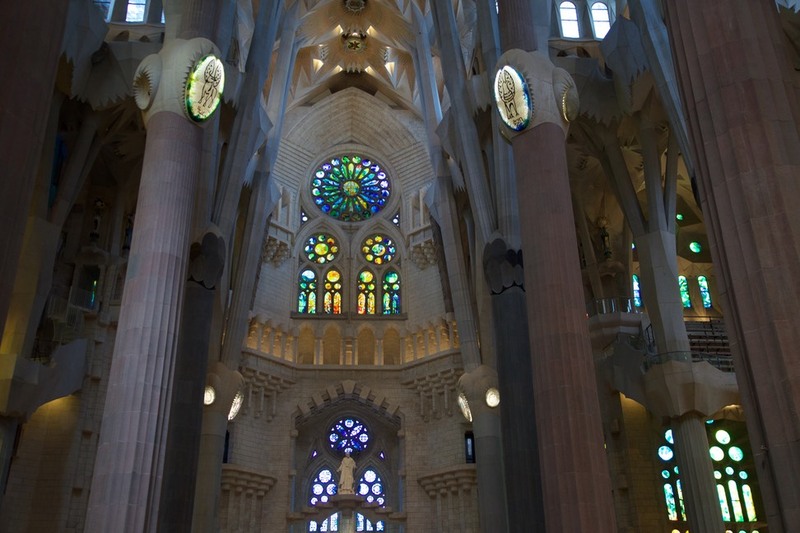 Gaudi began work on what was a Neo- Gothic church one year into its construction in 1883 and set about changing everything with his vision of symbolism inspired by nature. 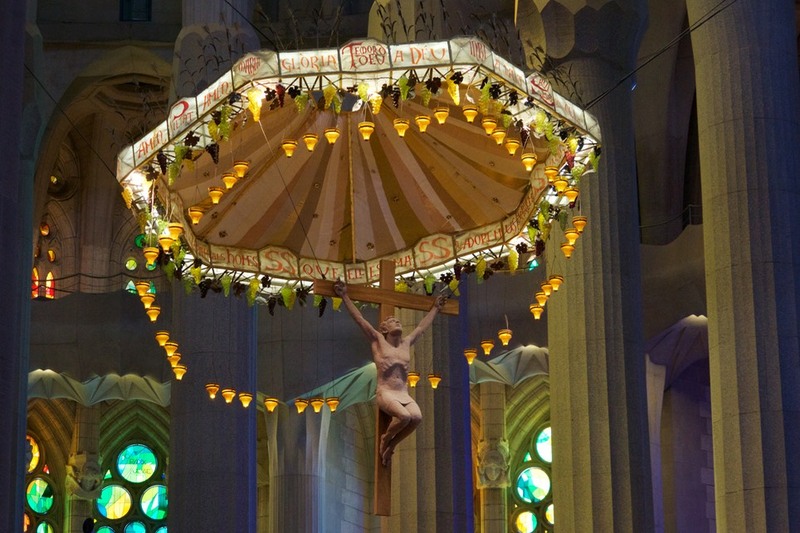 For 14 years he dedicated his life to the construction of Sagrada Familia until his untimely death after being hit by a tram in the June of 1926. Gaudi is buried in the Crypt of the Sagrada Familia. 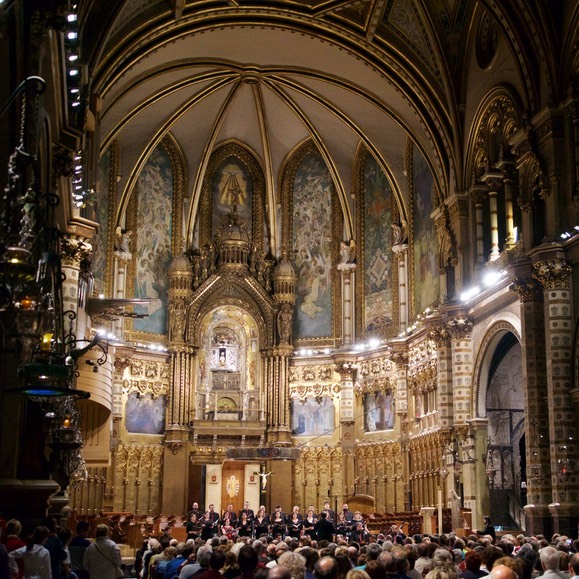 Today the ongoing building of the church is funded by the public and the Gaudi Foundation. 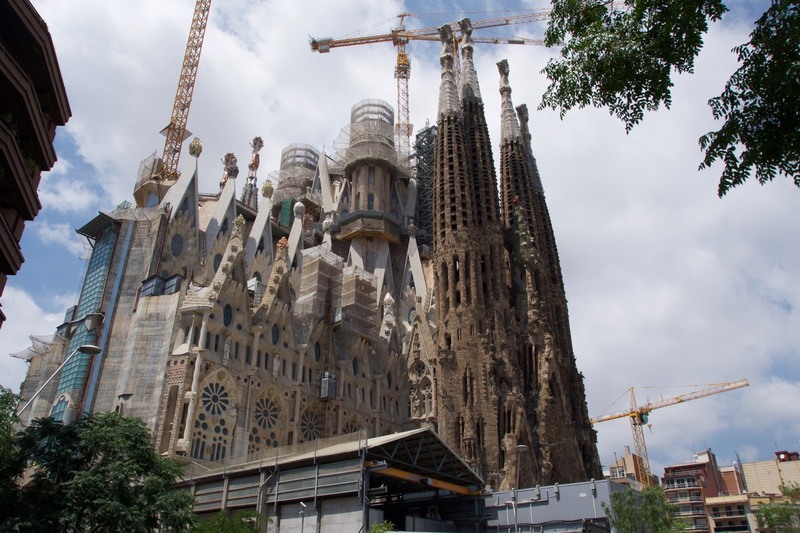 It is hoped that by the first third of the 21st Century the Sagrada Familia with all of its 18 towers will be completed. We were able to get tickets for the Passion Tower. A lift is taken to the top of the tower then 400 steep stone stairs need to be descended to return to ground floor. 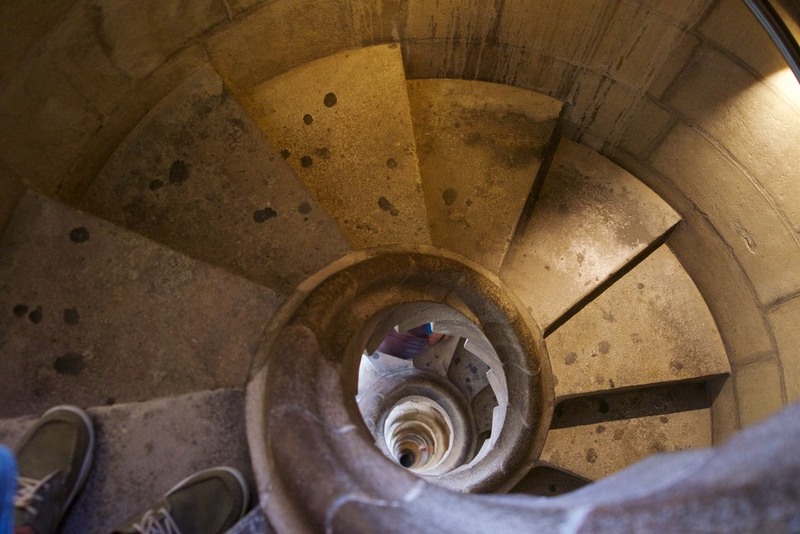 Apparently they rate amongst the top five perilous steps in the world and we will attest to that. The Passion Facade is dedicated to images related to the Crucifixion of Christ. The sculptures are all in natural stone, devoid of all colour to portray the sadness of the scene. In stark contrast inside the church are huge stained glass walls and sculptures that are highlighted as the light passes over the church at different angles throughout the day. Even with commentary it was difficult to take in all of the architectural features many that would have been revolutionary in Gaudis time. Before Jim and Cathy were to leave Jim just had one request - a rather unusual one for someone not that fond of heights. 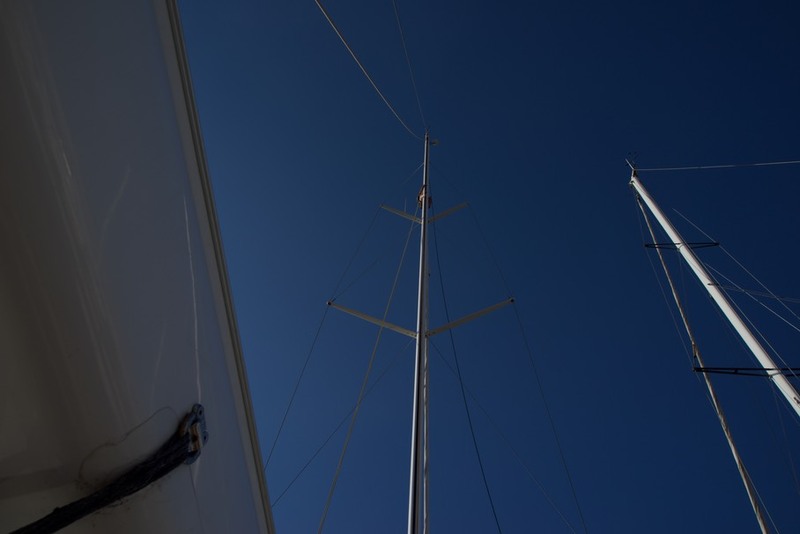 He wanted to go up the mast - and so he did. Although from Lee's perspective he looked very much like a koala at times with his arms trying to wrap around the mast he descended with the biggest smile on his face. So ended another great trip with them onboard Katherine. Who knows where the next adventure with them will take us. Till next time Jim and Cathy.